Letters on the Ministry, Ritual and Doctrines of the Protestant Episcopal Church: Addressed to the Rev. Wm. E. Wyatt in Reply to a Sermon by Jared Sparks. The Steward of God: A Memorial of the Rev. William Edward Wyatt, D.D., Rector of St. Paul's Parish, Baltimore. Baltimore: Printed by J.D. Toy, 1864. A Sermon Exhibiting Some of the Principal Doctrines of the Protestant Episcopal Church of the United States by which that Church is Distinguished from Other Denominations of Christians. Baltimore: Printed by Joseph Robinson, 1820. An Address Delivered in St. Paul's Church, at the Request of the Union Board of Delegates from the Sunday Schools of Baltimore on the Second Anniversary of Their Institution, January 1st, 1820. The Gospel Preached to the Poor: A Sermon, Preached at an Ordination Held by the Rt. Rev. James Kemp, D.D. in Trinity Chapel, St. James' Parish, Baltimore County, September 17th, 1823. Christian Offices for the Use of Families and Individuals, Compiled from the Liturgy of the Protestant Episcopal Church, and from the Devotional Writings of Various Authors, together with a Calendar. A Discourse on Christian Education, Delivered before the Association of the Alumni of Columbia College, at Their Anniversary, October 9th, 1833. The Monument: A Small Selection from the Sermons of the Late Right Rev. James Kemp together with the Address Delivered at the Time of His Interment, to Which are Prefixed, Brief Biographical Notices of the Bishop. Morning Visits to the Rector's Study: On Baptism. New York: Protestant Episcopal Tract Society, 1834. Morning Visits to the Rector's Study, or, Conversations on Confirmation. New York: Protestant Episcopal Tract Society, 1838. A Scriptural Exposition of the Church Catechism: Containing the Young Christian's account of the Doctrines and Duties of His Religion, and of Those Divine Authorities upon Which He Builds His Faith and Practice. Baltimore: Protestant Episcopal Female Tract Society, 1839. A Lecture, Introductory to the Course, Delivered before the Library Association of the Mechanical Fire Company of Baltimore. Baltimore: J. Robinson & Knight & Colburn, 1841. The Priesthood in the World: A Sermon Delivered at the Ordination of the Rev. D.H. Buel, to the Office of Priest, and of N.A. Hewitt, J.R. Gordon and A.J. Berger to the Order of Deacons, in St. Paul's Church, Baltimore, on Sunday, 24th September, 1843. Baltimore: Knight & Colburn, 1843. New York: D. Appleton, 1846. The Parting Spirit's Address to His Mother. A Sermon, Preached in Grace Church, on Sunday Morning, April 30th, 1854, the Day after the Destruction of St. Paul's Church by Fire. 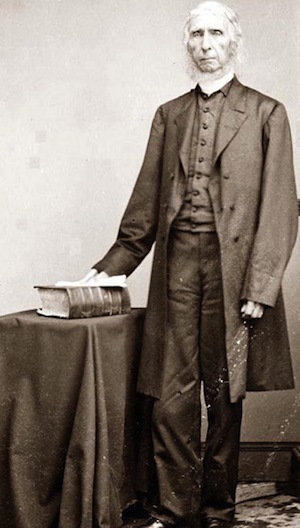 A Sermon Preached in Grace Church, May 8, 1859. Morning Visits to the Rector's Study. On Baptism. New York: Protestant Episcopal Tract Society, no date.